﻿ Paul Lacroix is a creator in the field of new technologies, with a particular interest in human-computer interactions, real-time rendering, and projection mapping. Through collaborations with experts in traditional disciplines and arts, he produces unique experiences, always trying to keep a certain balance between the technological aspect and the reality. 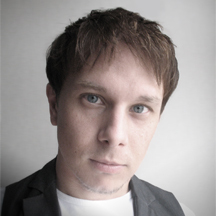 After graduating from University Paul Sabatier of Toulouse in France with a Master's Degree in Digital Image Engineering, he came to Japan where he has been living for more than 13 years. His early work focused on 3D scanning in the medical and the cosmetic field. After a couple of years, he decided to get closer to the creative world and start working at Polygon Pictures, a company producing CG movies. During that period, he enjoyed working among modelers, animators, and other CG creators, developing for them some original software tools to be used in worldwide class productions. He had the opportunity to take part in amazing projects, like the creation of brain images for the new version of the cult movie "Ghost in the Shell 2.0" or the development of customized plugins to be used in the TV series "Tron: Uprising". In 2009, Paul Lacroix started to explore new ways to combine his skills in computer vision and programming with CG and design. He began developing real-time interactive contents using sensors reacting to human movements: "It creates a link with the audience that is not anymore a simple observer, but also becomes a full actor of the digital composition". While working on a virtual fitting room for clothes, he grew a great interest into physics simulations: "Design a mathematic model to represent something real into a computer; precise enough to give a realist aspect, but simple enough to be able to run in real-time". At that occasion, he entirely wrote a virtual textile simulation engine. At this period, he also conceived a live 3D character system for SEGA's amusement parks. Based on motion capture and real-time rendering techniques associated with acting and dancing, this project involved not only CG creators but also live stage experts and dance performers. It was an inspiring experience with a strong influence on his work afterward. Also active in the field of projection mapping, he acts as a consultant between the creative team and the technical team, designing optimum workflow to generate 3D contents in complex projection situation. He notably worked on the "Seikei University Projection Mapping", the first big event of the kind in Japan, then took part in the construction of the permanent outdoor projection mapping system "Dockyard Garden" in Yokohama, and later in events at "Caretta Shiodome" or "Tokyo International Forum". His experience in human body sensing and projection mapping lead him to create the world's first real-time face tracking and projection mapping system used in "OMOTE" (more than 5 million views in a single week). Pursuing improvements of his facial mapping technology, other projects followed: "Face Hacking" on the Japanese television, promotion video for the Japanese release of the movie "Ghost in the shell", collaborations with the British artist "Empara Mi" or with the Japanese rock band "Kamiboku". These last two years, he also explored further the field of projection mapping on human body in motion with "EXISDANCE". Paul Lacroix is a passionate person always eager to face challenging projects with other passionate people: "I really enjoy working with other creators and artists. Starting from an idea, a dream, a vision; we talk about it, I found a way to turn it into something real".